Another season of Central Mass lacrosse is in the books, and several teams made headlines statewide with their stellar play. Whether it was St. John's scoring big wins against Eastern Mass foes, Shrewsbury earning its first ever district title or Worcester coming out of nowhere to grab a share of the Mid-Mass. crown, teams from across the region had seasons to remember. For more on those stories, you can check out my end of the year wrap up/Power Rankings, but below is my Central Mass All-Star team and Award Winners. Congratulations to all the players, coaches and parents that made 2014 a special year for CMass Lax. Note: All-Americans are indicated with an (AA) at the end of their listing. Smiley and Ward were really no-brainers, as they led the most lethal attack in Central Mass and one of the best in the state. Smiley was a returning All-American and garnered a ton of preseason attention, but Ward come up from the JV to make a huge impact as a junior, leading the Pioneers in goals and total points. Bowler makes the list after he lifted the play of everybody on Worcester, and powered the Warrior attack down the stretch to the program's first ever league title. Buduo filled some big shoes up front for Shrewsbury, and emerged as one of the region's most complete attackmen during the Colonials' run to the state semifinals. Kapuscienski also had huge shoes to fill, replacing a pair of All-Americans for Grafton, but the sophomore was more than up for the challenge, powering the Indians to a district final and league crown. Bouchard helped Leominster go from a .500 team to a Midland B champion with his 95 points, and the Blue Devils were quietly one of the better stories in Central Mass. Vachon finished second in the region in scoring, and made St. Bernard's a tough out for anybody, while Wood served as the veteran leader of a young and improving T-Hawk attack and midfield. SPM's LeClair gets the final nod, after his powerful shooting kept the Guardians competitive in coach Bob Stamm's first season. Oh yeah, and he also scored 13 POINTS IN A SINGLE GAME (9G, 4A) earlier this year against Bromfield. After several years of stellar play, Forbes finally earned his All-American distinction in 2014. The do-it-all middie lifted the Crusaders to the D3 Central/East title game, and will graduate as one of the program's all-time greats. Bryan-Massop was as electric as any midfielder in the state, breaking defenders down and scoring goals with his phenomenal dodging ability. Dell'Olio scored, passed, defended and led Shrewsbury as the Colonials rebuilt their offense from last season, and Shrewsbury's late-season offensive surge is proof that he did a fine job. Foster suffered a bit from Westboro's balance, as he couldn't quite put up the numbers of other pure scoring middies, but the Rangers' most dangerous weapon has one of the hardest shots in the state, and I wouldn't be surprised to see him earn All-American honors as a senior next year. Butler went from surprising contributor for St. John's last year to one of the most respected captains and leaders in the state this season. Bianculli, meanwhile, lit up the scoreboard all year for the Rams, leading the region in scoring and propelling Shepherd Hill to a playoff berth in Division 2. Foley was an Academic All-American, but also one of the best scoring middies in Central Mass, while Gallo was again fantastic for Westboro's lethal midfield. 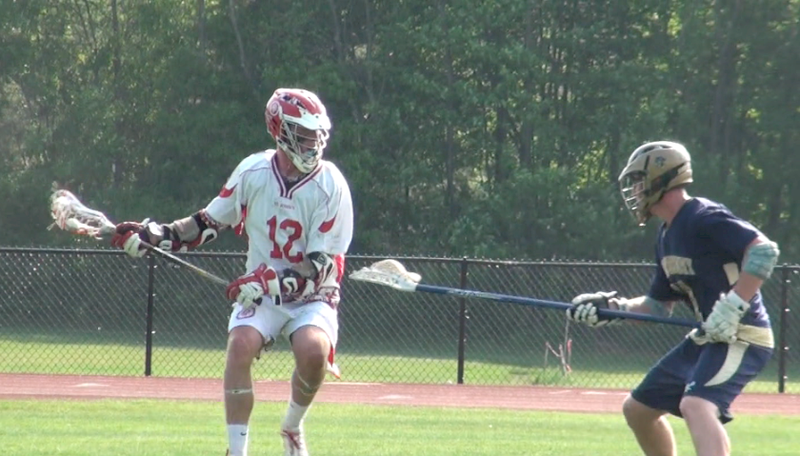 Dawson provided just the scoring punch Wachusett needed to pull off an upset against Shrewsbury and qualify for the D2 playoffs, and his buddy Tom Bishop defended and possessed his way to an All-American honor at LSM for the Mountaineers. Connor Maloney was the region's top face-off specialist, but Martens had a great season at the X for the T-Hawks as well. Rounding out our list of middies is Shrewsbury LSM Tom Aulenback, who was an integral part of the Colonials' championship defense, and was as comfortable with the ball as any long stick in the region. I don't know how Couture didn't earn All-American honors, but the gigantic defenseman made life miserable for every opposing team's top goal scorer. Dufresne is another gifted pole, and his physicality again made him a force for the Crusaders. Will Roberts stepped up to fill the shoes of last season's Defensive Player of the Year, Aidan Fox, and with help from DeFlumeri, the Pioneers were again able to field one of the state's best defenses. Mariano led a rebuilt Tomahawk back line that improved as the year went on, and Ducey has been hailed by those around Northbridge as one of the best poles to ever come through the program. Championship defenses aren't built around one or two people, as Tim Hally proved in a fantastic and emotional season with the Colonials, while the Arsenault brothers split a spot for their work keeping Nashoba afloat through an injury plagued season. Vella, a standout on the Leominster football team, rounds out our list for his work turning the Blue Devils' lacrosse fortunes around in 2014. Like last year, I'm going to cop out and not make some tough decisions, because choosing between some of these guys is truly splitting hairs. Gorman and Kerr were two of the best goalies in the state, and I can't say either doesn't deserve to be a First Team player. They were each that good. On the second team you have Moran and Msumba, two guys that came out of nowhere to emerge as some of the best players in Central Mass. Moran and Worcester were the feel-good story of the region, but Msumba's presence in net turned a season of transition into another trip to the district finals for Grafton. So much for rebuilding years. Atwood was another bright spot and stabilizing force for the Chieftains, who lost a ton up front and in their midfield due to injuries, but the talented sophomore showed he's ready for the big time and will be one to watch in 2015. Skirvin is another player that came out of nowhere, replacing a pretty darn good goalie in Dan Terry and leading the Rangers to their best finish since 2008. Here's where I have to split hairs and give Gorman the slight nod ahead of Kerr and teammate Griffin Couture. If this were a regular season award, I probably would have gone with Kerr, who maximized his one year of starting between the pipes for the Pioneers, but Gorman's playoff run pushed him over the top. The All-American goalie made the game-winning save for Shrewsbury against St. John's, and stood on his head throughout the fourth quarter and first overtime period in the district title game against Westfield. He seemed to have the uncanny ability to make momentum-changing saves all season long, and his ability to rob opponents, then push the ball the other way helped Shrewsbury capture the Division 2 Central/West championship. Unless you were a frequent observer of junior varsity teams in the region, you probably didn't know who Jared Ward was until he announced his arrival with a hat trick against Shrewsbury's vaunted defense in late April. After tearing up the JV ranks last season, Ward moved up and did the same at the varsity level in 2014. The slick-scoring junior led the Pioneers in goals scored and total points, and his balance moving around the cage allowed him to score wrap-around goals with ease. He also proved formidable dodging and cutting off the ball. Basically, the Pioneers replaced elite scorers Hunter Burdick and Josh Freilich with another one of the state's best players. Not that anybody could have seen it coming, but Ward, along with fellow attackman Parker Jean, made the Pioneer front line more lethal than ever. The pressure now falls on Ward to lead the attack and produce in 2015 without All-American Drew Smiley. Something tells me he'll be up for the challenge. There are plenty of arguments to be made for other great players, but what Smiley did, with all the pressure of being a returning All-American, and while replacing two phenomenal attackmen around him, is astounding. The Navy commit was once again one of the best scorers and leaders in Central Mass, but his ability to draw the attention of the defense and create for others made life easy for new attack mates Jared Ward and Parker Jean. This season may not have ended quite the way he had hoped, but Smiley still led St. John's to perhaps the greatest regular season in Central Mass lacrosse history. The Pioneers scored some of the biggest wins in the history of their storied program in 2014, defeating Eastern Mass powers Xaverian, St. John's Prep, BC High and Acton-Boxborough, along with running the regular season gauntlet in Central Mass. With Smiley leading both the St. John's lacrosse and football teams, the Pioneers won a district lacrosse title and played at Gillette Stadium for a football state championship, but this isn't a lifetime achievement award. Smiley was the best player in Central Mass this year, and one loss doesn't change that. Another cop out answer, but both of these guys pressed all the right buttons this year. Skermont turned things around after the Colonials endured a three-game losing streak, leading Shrewsbury to eight consecutive victories and a district championship down the stretch. Always known for building physical and disciplined defenses, Skermont maximized his talent and delivered the first district title in Shrewsbury boys lacrosse history. His development of Joe Buduo and Derick Tinsley paid dividends late in the season when those two emerged as stars in the playoffs, and his decision to play experienced middie Derric Dell'Olio all over the field proved valuable against both St. John's and Westfield. Speaking of maximizing talent, that is just what Jones did with Worcester's Combined lacrosse team. After the program won just six games the previous seven years, Jones led the Warriors to a 16-2 record and a share of the Mid-Mass. crown. It hasn't been easy, but in his five years leading the program, Jones has instilled a work ethic and blue collar mentality that has resonated with his players and the Worcester community at large. A former NCAA lacrosse player at Syracuse, Jones has taken great athletes like James Bowler, Jack Gallagher and Jahmal Bryan-Massop and turned them all into high-level lacrosse players. Things are constantly in flux for a team that fields players from several different schools throughout the City of Worcester, but Jones seems to have built a formidable new program to be reckoned with. How does Cotoni from Groton-Dunstable not even make third team attack as the leading goal scorer on a team that went deep in the playoffs and plays almost all divison 2 teams regular season. I can see it pays to play a weaker schedule and load up on points for this poll. As an example some of the attack would not even get any PT at other schools. I like your format with 3 players at each field postion for each team and 2 goalies on each team. Makes more sense than most post season awards. Playoffs look to not be considered and points against weak opponents seem to count. Mid Wach all Star selection seems to not be considered either. Congrats to those who were named but Joe, if you are naming a team at least give the criteria on how you chose and not a big game against a team that won a total of 2 games and had the second highest goals against in central mass. Credibility is what a writer strives for, too many omissions and head scratcher additions. Let me just say that I have no problem with anybody arguing that a player SHOULD be on this list. In fact, I would encourage that. But come on, all these kids had great years. Let's not take that away from them by claiming they don't deserve recognition or saying ridiculous things like they wouldn't play elsewhere. Ultimately, this was a very difficult list to make because so many teams had great years and so many kids had big moments. Just off the top of my head, Zach Cotoni from Groton-Dunstable, Devin Pietz from Shepherd Hill, Jack Gallagher from Worcester, Kyle Lemack from Westboro and a couple young middies from Algonquin were all tough to leave off. I can understand being frustrated, but please try not to take your disappointment with my selections out on a kid that worked hard and had a successful season individually. Oh, and check out this video. It's some beastly stuff. Nothing against the years the kids had and congrats are in order but playing at a better team with a tougher schedule , sometimes a much tougher schedule, seems to not have much weight in your decision process. Even playing on a bad team that played a harder schedule and still putting up numbers seems to have little credence. Congrats to all who made the CMass All-Stars! Only thing Buduo is first team over Bowler. Buduo had multiple points in leading Shrewsbury to a win as Bowler and Worcester were handly beaten. Big Players show up in playoffs. Watch some of the teams where a coach will sub and not let his team run up scores. All student athletes deserve accolades, but only a few can make someones list and sometimes the list is like Bostonlax which ignores many teams and players due to their affiliation with certain club teams. Your point about the playoffs is valid, and the main reason I had Gorman as my DPOY and guys like Buduo and Hally jumped up the list after big performances in the tournament. At the same time, not every kid is fortunate enough to play on a successful team. They can't control their supporting cast (usually) and they don't make their team's schedule, so I didn't want to punish them for that. As for the club comment, I can assure you I didn't base anything on where a kid plays his club lax. That is something I hope to cover in the future, but as of now, I don't even know which club teams most of these kids play for, nor do I particularly care. Regarding BostonLaxNet, I helped pick the "Central" members of their Central/West All Stars, so again, club ties had no bearing on anything. Unfortunately, the Boston Lax AA/all star selections ignore CMass and Western Mass with the exception of the AA s. Besides the AAs were there any others from C or W Mass invited this year? Last year only 1 (maybe 2 ...can't recall)! In doing his they are missing anywhere from 6 to 10 players that could be an impact on any team in the state. It's truly an EMass ISL who's who with a reluctant nod to the AAs in the other 2/3 of the state. Oh, you're referring to the All American Game LaxNet just held. Yes, that is pretty much an EMass affair, with the AAs from CMass and WMass getting a chance to play. I didn't have a hand in picking those teams, and I did nominate several other CMass guys (Couture, Ward and Foster to name a few), but ultimately they didn't make the cut. But, be on the lookout for LaxNet's All Central/West team that should be coming out soon. I have to comment though about the the boys from worcester, great season . no question, But i have hard time seeing recognition for kids that don't honor the game. fighting is unacceptable in my opinion, they play a brand ( a lot of the time) of lacrosse that i for one am not in favor of. If you get suspended for games, you should automatically lose any rights to be on this list , or any other list. It's a shame , because they have talent ,, not disputing that. 13 points against bromfield …. seriously…?? i know a couple 8th grade girls who would have done that against bromfield…. come on man… why the hell was he still in there? no underclassmen that could have used the playing time ?